Our sturdy gas bottle storage cages are an excellent solution to your medium sized Gas Cylinder or Propane Bottle storage needs . 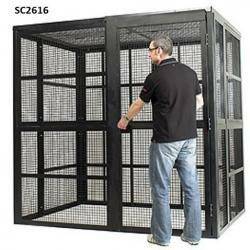 The range of Gas bottle storage cages will accomodate a quantity of 3 upto 24 large cylinders (19KG). 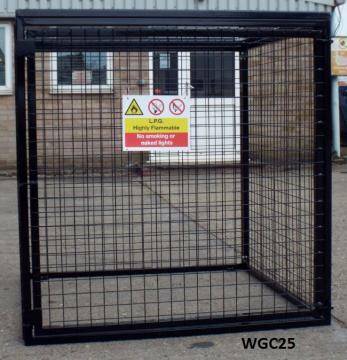 The Gas bottle storage cages are manufactured from 30mm steel section with 50mm square 3mm mesh infill with fixing points for bolting to the floor. The gas bottle storage cages are supplied flat pack with all required fastenings and are easily assembled using bolts and handtools. All Gas bottle cages are fitted with a hinged door fastened with a hasp and staple and complimentary padlock and safety sign. All units are attractively finished in Black , Blue, Red, or Yellow to suit your colour requirements . fixing points for bolting to the floor. Gas Bottle Storage Cages are supplied flat pack with all required fastenings and are easily assembled using bolts and handtools.